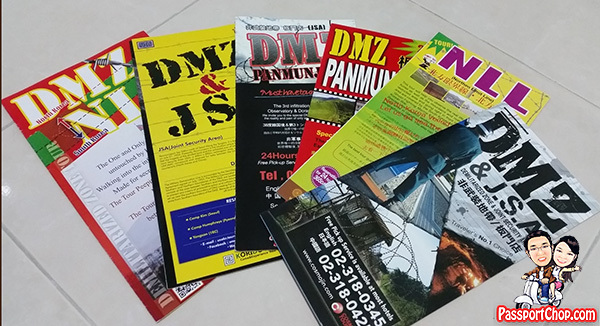 There are a lot of tour companies in Seoul offering tours to the Demilitarized Zone DMZ. 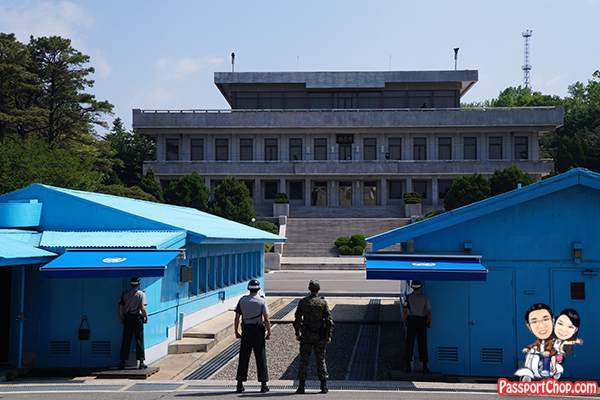 You have to be clear what you want to see – do you want to “cross” over to North Korea territory via the blue house you see in the picture below (the MAC Conference Room)? If so, you need to ensure that your package includes a tour of the Joint Security Area. 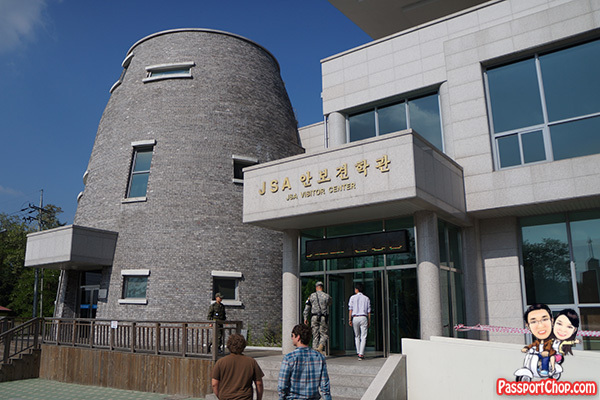 Not all tours go to the Joint Security Area (JSA) as a limited number of visitors are allowed per day and also not all tour operators can do tours to the JSA. Some tour operators include amethyst or ginseng factory tours too – the usual tourist rip-off shopping so skip those tours unless you are really into amethyst or ginseng. 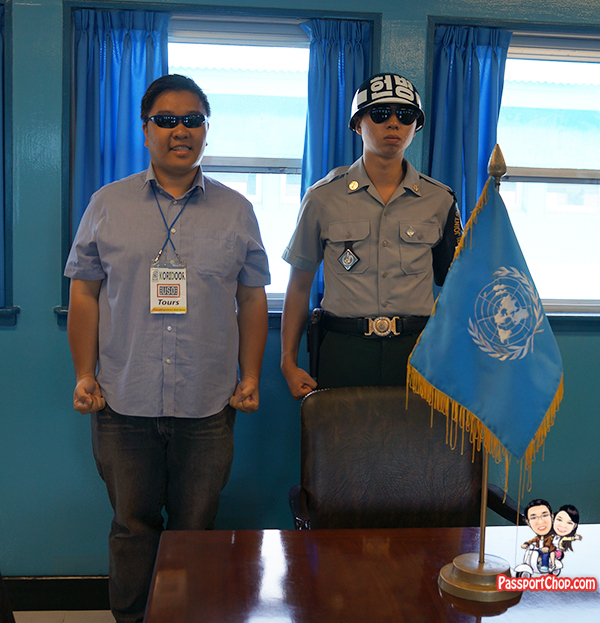 We took a tour to the DMZ and JSA with Koridoor Tours. They seemed to be run by United States Organisation – a nonprofit organisation setup to provide recreational activities for US soldiers stationed overseas and it is located at a US army camp in Seoul so it seems quite legitimate to me. Koridoor runs quite a few tours daily (half-day, full-day, DMZ only, DMZ/JSA) and there are a few tours that include visits to amethyst/ginseng center so choose carefully (they are very transparent about their DMZ/JSA trip itineraries) on their website. The cost for a JSA/DMZ tour by Koridoor is USD 92. There have a price rate of M:USD 46, C:USD 92. M is only for active US military personnel or military dependents – most of us belong to the C (Civilian) category. You can pay by cash but you will need to go down to the USO centre at Camp Kim to pay in person a few days before the tour. So for most of us tourists to Seoul, we will have to pay by credit card – do note that the price charged to your credit card will be based on Korean won (KRW) – M:48,000 won & C:96,000 won. 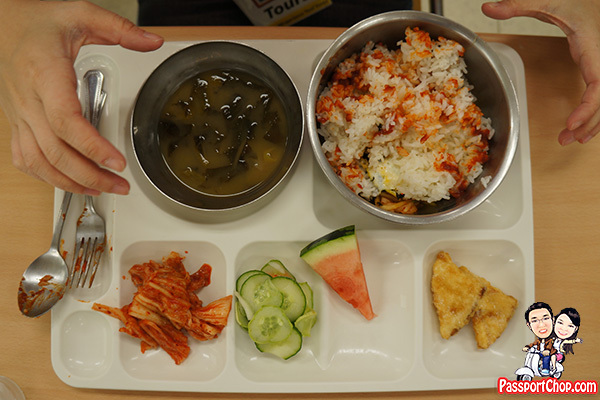 Lunch is not included with the tour fees – you can either bring your own picnic or pay 10,000 won for a buffet lunch at the cafeteria at the Dora railway station. 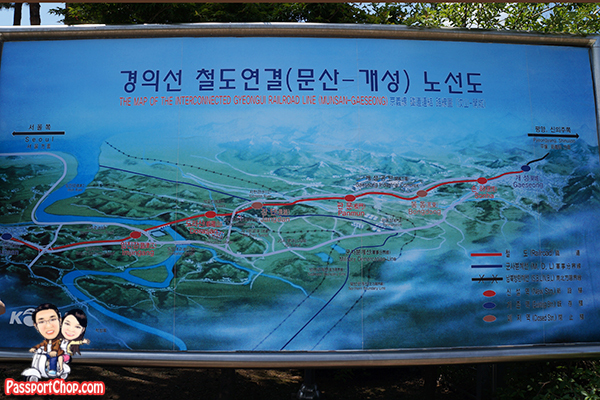 This is the itinerary of the Koridoor DMZ/JSA tour we took. You will need to arrive at the USO Tour office at Camp Kim with your PASSPORT or Military ID card at 7am. Do not be later than 7.30am as they are very strict on the itinerary timings and will leave without you with no refunds to you. Tank tops or sleeveless shirts/tops or those that expose the midriff. If you are going to wear a shirt, it must be a collared shirt – no T-shirts. 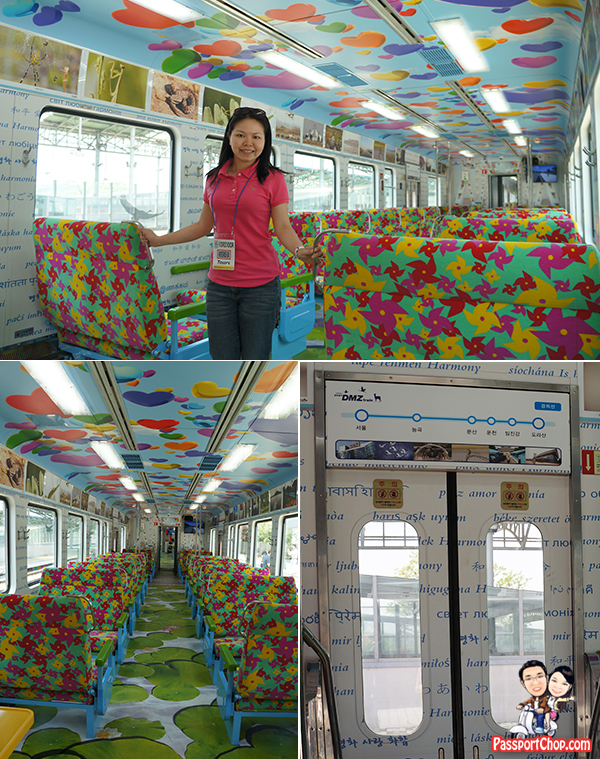 We stayed at J Hill hotel in Myeongdong so we took a metro from Myeongdong station. 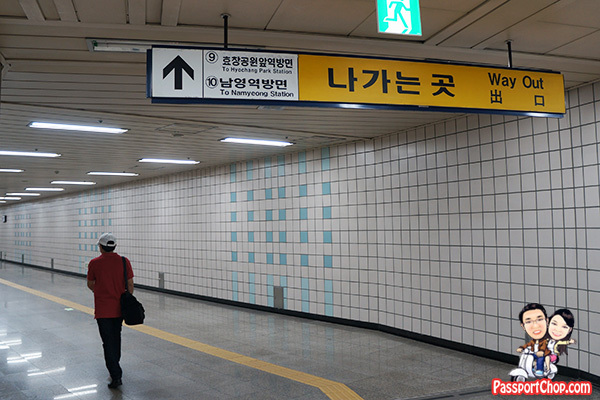 The closest metro stop is SAM GAK JI (삼각지) Station – line no 4 and 6. Exit at the no. 10 exit and walk about 300 meters (7 mins) to the Camp Kim /USO entrance. This is the official walking and driving map issued by Koridoor Tours on how to get the USO Tour Office for the DMZ/JSA Tour. If you are also alighting at Samgakji (삼각지) Station, look for exit 10 – as seen in the signboard below. 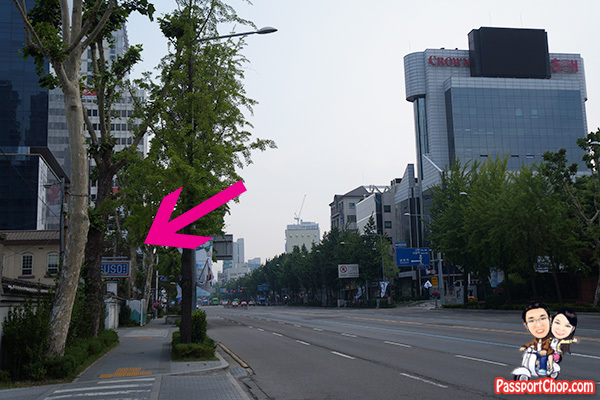 Once you exit from Exit 10, look out for the tall building (CROWN) – CROWN is a well-known brand in Korea for their biscuits – on the other side of the road is Camp Kim (you will find a sign – USO). Don’t walk into Camp Kim! Just like a typical Singapore army base – there are guards and security clearances required. 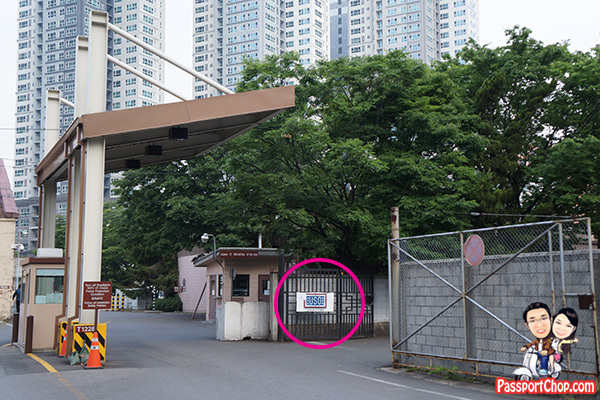 The USO Tour office is just outside Camp Kim itself and there is a gate to go into the USO Tour office (separate from Camp Kim). 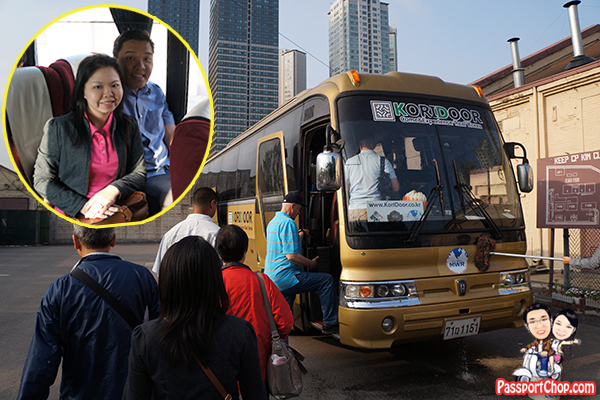 Once you get into USO Tour Office, register your attendance and wait for the bus that will depart at 7.30am. There are no cafeteria or snack vending machine when we were there so eat something for breakfast before coming to Camp Kim (or tabao some food but consume them before you reach the DMZ area). 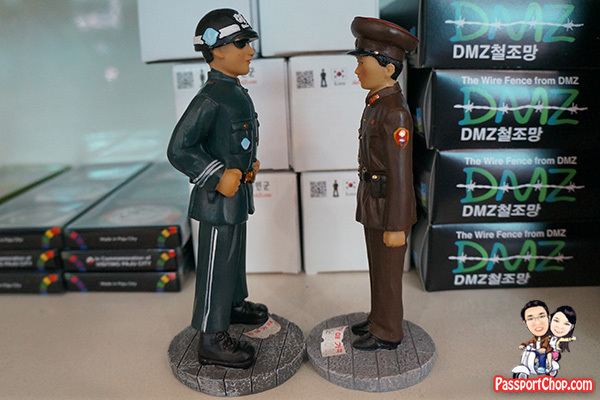 You can also buy DMZ souvenirs at the USO office. There are quite a few comfortable reclining chairs at the waiting area in the USO office so just sit back and relax while you wait for the bus. 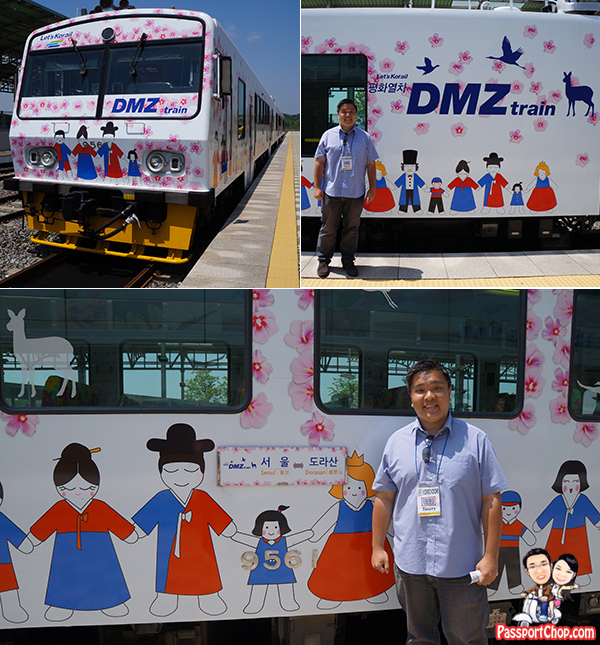 The Koridoor tour bus will depart from 7.30am sharp for the DMZ/JSA tour so don’t be late! Our first stop is the Joint Security Area (JSA) Visitor Centre. Another name for the JSA is Panmunjom and it refers to a 400m x 800m rectangular area, set up on the Military Demarcation Line (MDL) within the UNCMAC compound and reserved for talks between the United Nations Command (UNC) and its Communist counterparts (North Korea and China). 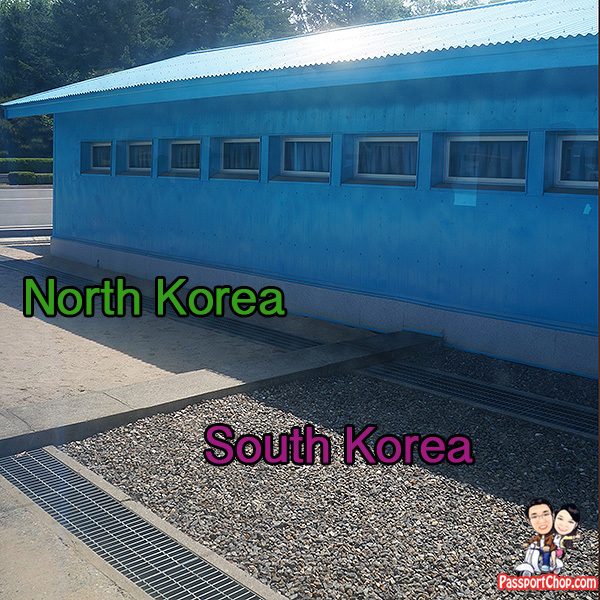 The Military Demarcation Line is surrounded by the Demilitarized Zone (DMZ) under the provisions of the Armistice Agreement signed on July, 1953. The Military Demarcation Line runs 155 miles and separates the South and the North. Southern and Northern boundaries of the DMZ are located 2 km apart from the MDL. This is what you will learn at the JSA Visitor Centre. All tour groups will need to sit through a briefing at Ballinger Hall in Camp Bonifas at around 9am. The Koridoor tour of DMZ/JSA is conducted in English – including this briefing too. 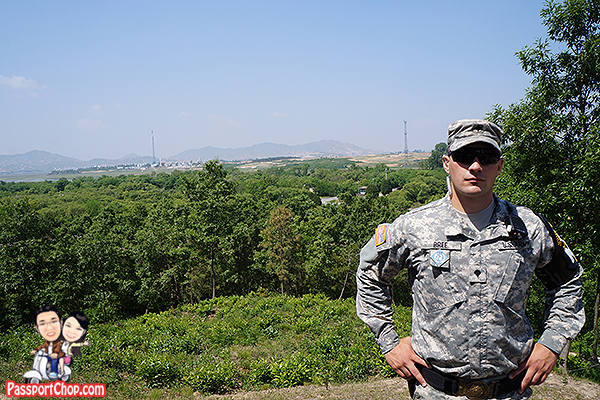 Our “tour guides” are US soldiers posted here as part of the JSA/DMZ security force. Although at times, our tour bus was just a few metres from the North Korea side of the JSA, we felt quite secure as we have a US soldier (tour guide) at all times when we were in the JSA. There is also a South Korean military jeep escorting the bus around the JSA area. 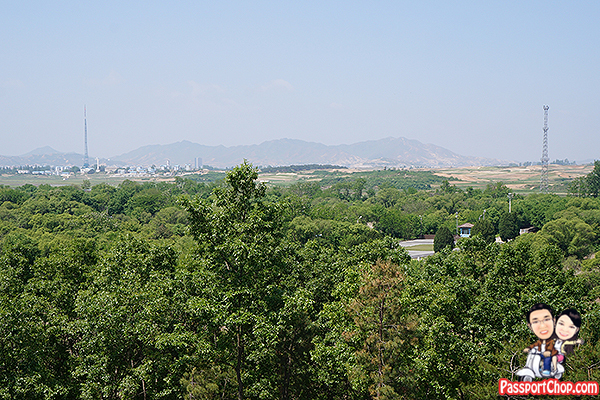 Some of the sights we see during the tour include the two tall flagposts indicating the North Korea Kijong-dong and South Korea Daesong-dong towns. The short story is that both sides kept outdoing each other’s flagposts in terms of height until one day, authorities on both sides decide it was enough and kept the flagposts as what we see now. This is just one of many interesting stories you will hear about the JSA during the tour. 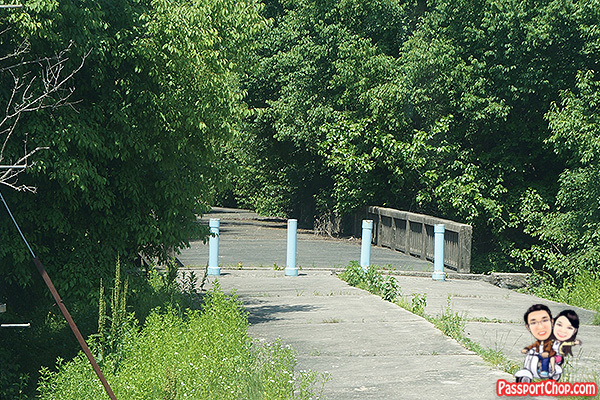 Our bus also drove past the infamous Bridge of No Return – this was where North and South Korea prisoner of war exchanges took place so once you cross over, there would be no return – thus the name of the bridge. We were not allowed to disembark but the tour would stop for a short while for us to take photos from within the bus. We also drove past the Axe Murder site – if you know your history of the JSA, this was one of the most prominent incidents that took place that triggered the clear separation of both sides’ guardposts in the JSA. 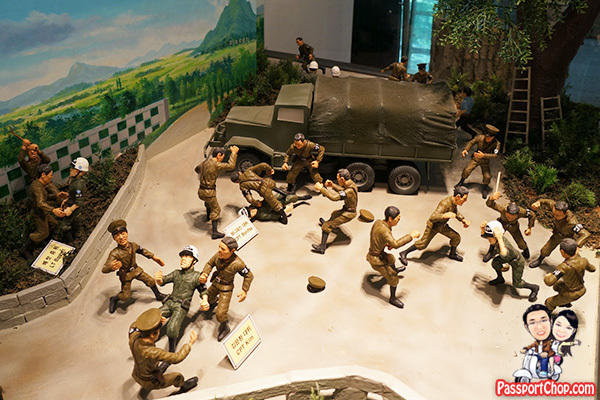 You will find a reenactment of the scene in the JSA visitor centre (as shown below). Our JSA tour guides – the US soldiers, were very strict and firm with their instructions – you are only allowed to take pictures when they say you can take pictures and no photography at all other times in the JSA. You are also not allowed to roam about on your own – you have to stay within the group. All these strict rules for good reason since you wouldn’t want to trigger the next war with the wrong move. Once our JSA tour was over, our guides were more relaxed and friendly and we even took photos with them! The highlight of the tour was to visit the Joint Security Area Conference Row where we faced the North Korean side of the Joint Security Area directly. 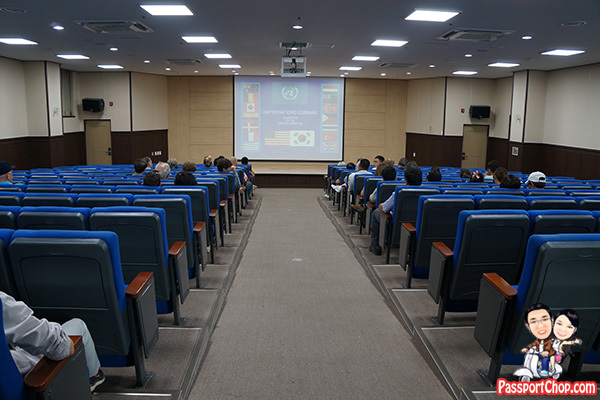 It is called the Conference Row because of the conference meeting rooms that straddles the North and South Korea border. Upon alighting from the bus, you will be guided to the Freedom House where the tour group is required to stand in one straight line. Once everyone is lined up, then you will be led in a single file outside. The whole group will then face the North Korean Panmungak building (the grey building you see in picture below) in one row. 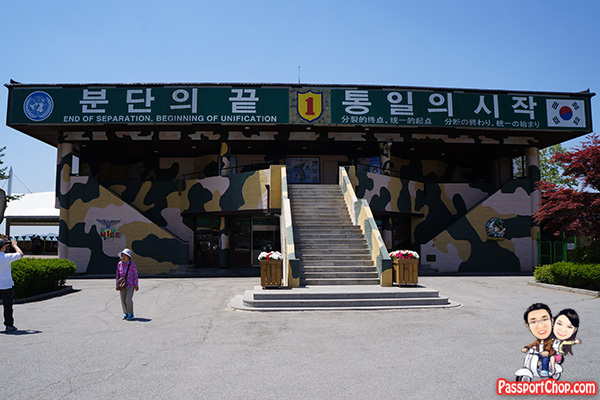 The US soldier tour guide will then provide an explanation of the buildings in the Joint Security Area and tell a few interesting stories about the area – all this while, you will not be allowed to take pictures or move about out of the single line. All this while – when he was talking, you might be able to see the North Korean soldiers looking at you through their binoculars from the safety of their building. When he is done with his explanation, he will then tell you that you have about 5 minutes to take as many pictures as you want but you are not allowed to walk down the steps or go beyond a certain area. After which, the group will need to regroup in a single file and then brought into one of the blue buildings – the Military Armistice Commission (MAC) JSA conference room where talks take place between both sides. 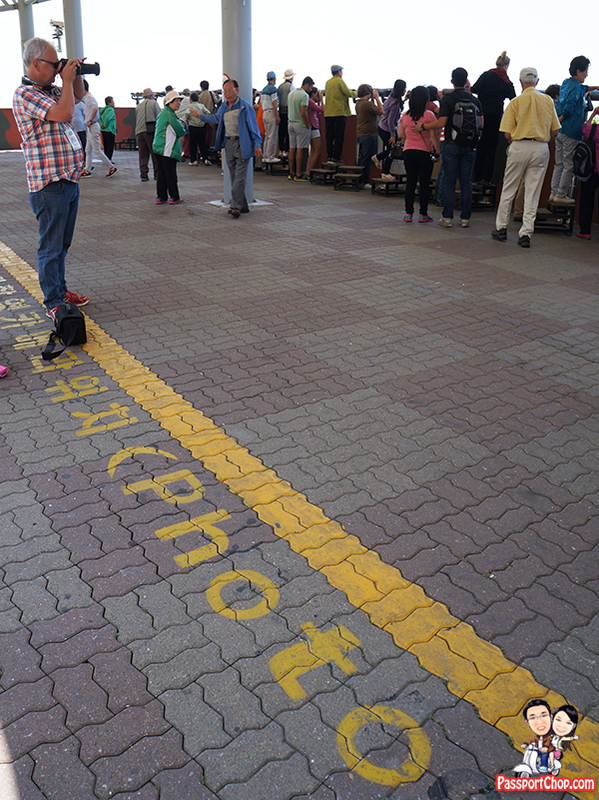 From here, you can legally cross onto the North Korean side since the room straddles the Military Demarcation Line (MDL) – marked by the concrete slab you see in the picture below. In the conference room, there are two South Korean soldiers in a modified Tae Kwan Do posture standing guard at the door to the North Korean side (I assumed that it was locked) and at the conference room table. Our tour guide provided us with a quick explanation of the conference room and interesting facts about it e.g. the translator box in the room and then gave us about 5-8 minutes to take photos in the room and we did all kinds of goofy shots with the soldiers trying to emulate their posture. 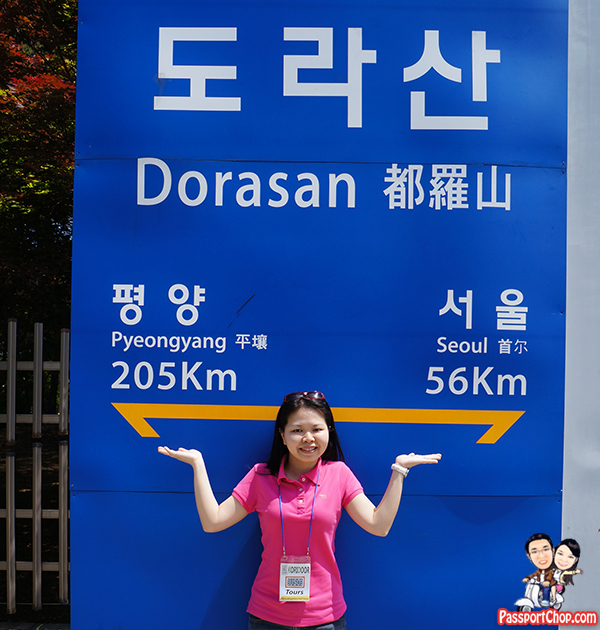 After the JSA tour, we were brought to a few areas in the Demilitarized Zone (DMZ) – one of which is the Dorasan Railway Station. 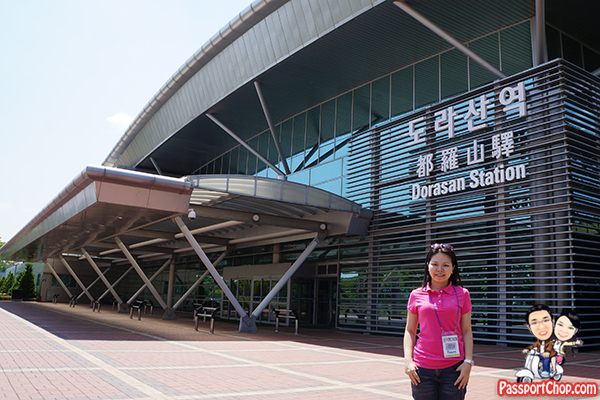 The Dorasan Railway Station is a relatively new station and its architecture design is just beautiful and modern just like Incheon Airport. The goal was to connect South Korea to the rest of the world through North Korea. From North Korea, trains can theoretically travel to China, Russia and the rest of Europe. 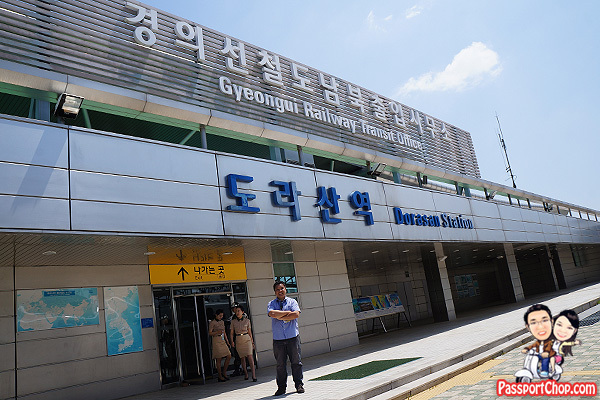 For now, Dorasan Station is just a dream – unless both Koreas unify, this will not happen. What you can do here is get a commemorative DMZ stamp/chop on your brochure or a piece of paper (as proof of travel to North Korea) but DO NOT do this on your passport! 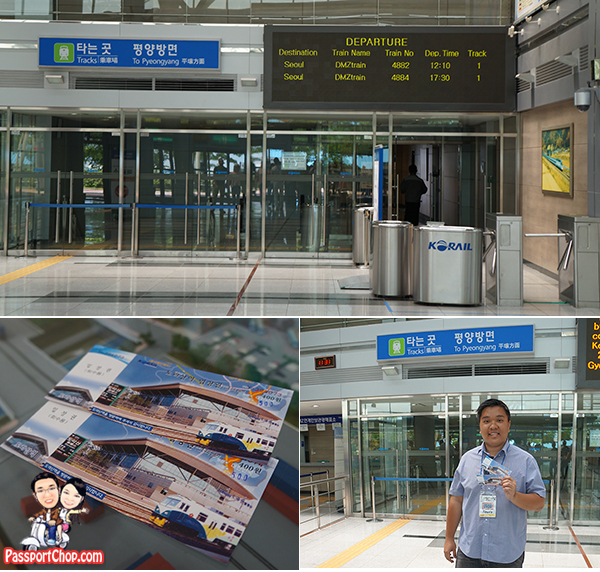 You can also purchase a 500 KRW (less than a dollar) train ticket to get onto the Dorasan station platform. … train interiors – we were quite concerned about the train departing with us on it so we always had someone at the door in case it tries to close. Don’t worry it won’t send you to North Korea even if the train does move along as these are Seoul to Dorasan trains but you Koridoor tour guide will have quite a few explaining to do to his bosses. 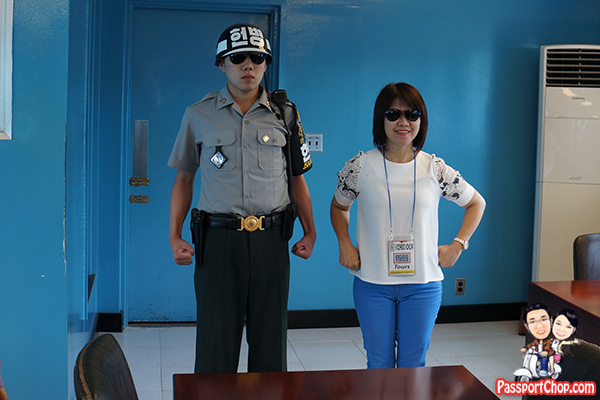 Once we are out of the Joint Security Area, the Koridoor tour guide will take over – he is a South Korean civilian. 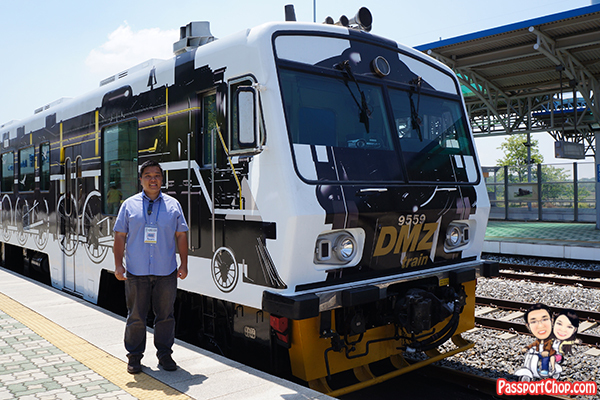 As part of the tour, you will have your lunch at the Dora Restaurant (located at the Dorasan Railway station). Lunch is not included with the tour fee so you will have to prepare 10,000 KRW to pay for the buffet arranged for the tour group. It is not compulsory to eat the pre-arranged buffet – you can pack (tabao) your own food for a picnic at the station. There are two options – vegetarian (bibimbap) or meat (beef bulgogi) – the meat option cost 10,000 KRW and the vegetarian option cost 8,000 KRW. Your meal comes with a complimentary can of Coca Cola. The food is served buffet style so you take as much as you want to eat but do note that the quantity of the food prepared for the entire tour group is not a lot especially for the meat option. Even if you don’t eat beef, the meat option offers other food e.g. sausages, fried eggs and fried fish (not exactly the healthiest options but if you need meat for your lunch, this is the option to go for). 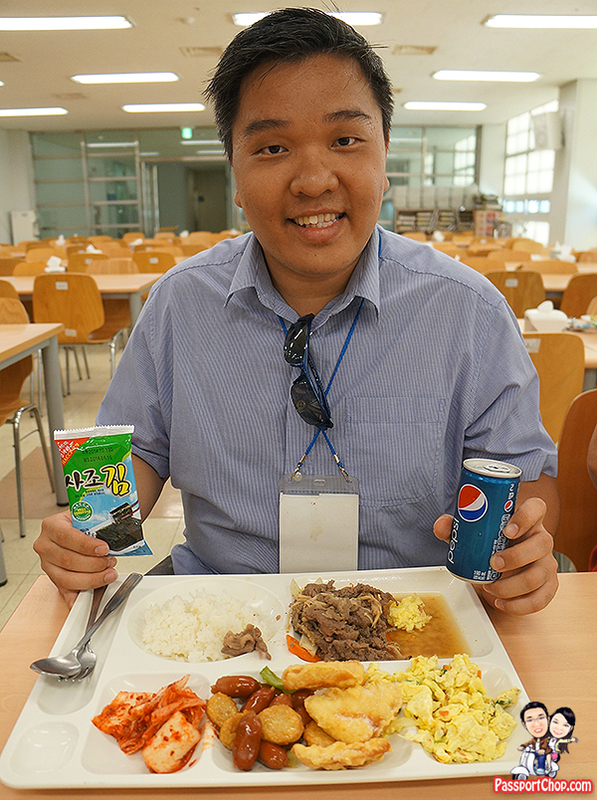 The seaweed (provided as part of the buffet) is very very good – you can eat it with your rice. This is the vegetarian lunch option for the DMZ/JSA tour with Koridoor. Not surprisingly, the meat option is the most popular of the two. 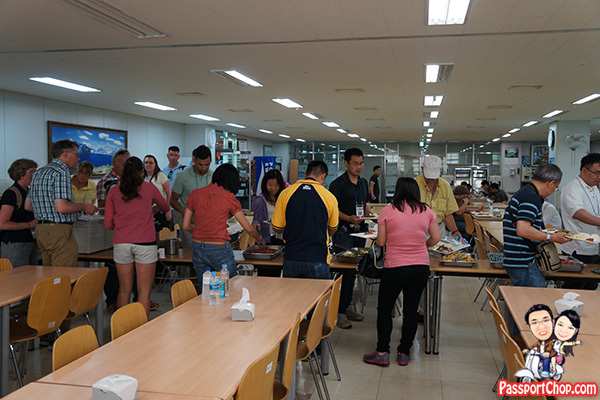 Once you are done with lunch, the next sight the Koridoor DMZ/JSA tour group will proceed to is the Dora Observatory. First the group will be brought up to the auditorium where they will provide a quick history and the area you can see from the Dora Observatory. No photography is allowed in the auditorium – i think it is because of the terrain model showing different locations in the area. 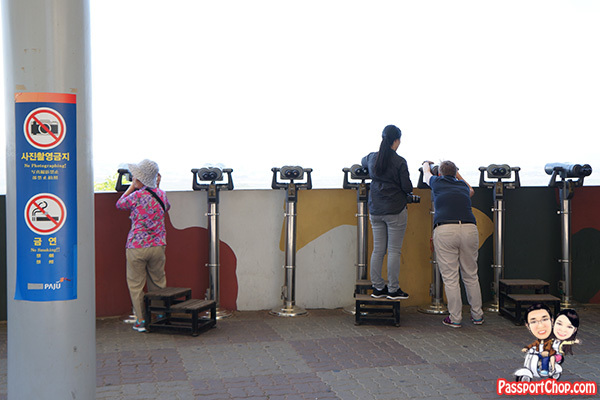 Here at the Dora observatory point, you will be able to see North Korea up close using the binoculars. You will need to activate the binoculars with 500 KRW (less than a dollar) for a short duration. To guide you on what you are seeing, there is a huge landscape map at the top of the observatory to tell you where and what you could see from here. Look out for the North Korean and South Korean flag posts and the North Korean propaganda town and Kaesong Industrial Park. 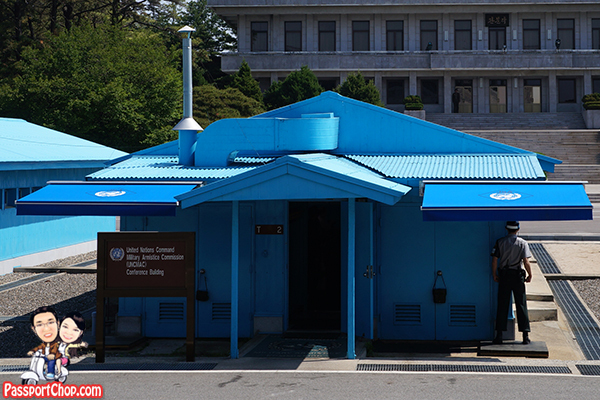 There is a small souvenir shop at the Dora Observatory area – you can buy all kinds of DMZ/JSA memorabilia here. Our next stop in the tour is the Third Infiltration Tunnel. 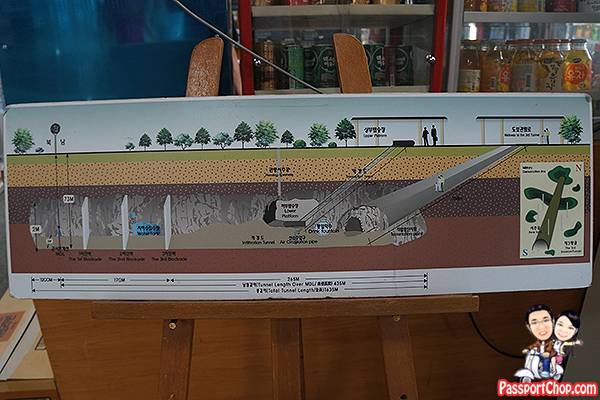 This tunnel was constructed by the North Koreans to infiltrate Seoul and carry out sabotage missions and move a lot of soldiers and tanks to Seoul in the event of an invasion. It is rumored that there are 17 of these tunnels that all lead to Seoul but only four have been found. To this day, the South Korean military are still looking for them. You will be brought into an auditorium for an audio-visual presentation of the history of Korean War and DMZ and then led through an exhibition before arriving at the Tunnel. I have to state upfront here that the Tunnel is not for everyone. It is a very steep climb down and up (you come down and go back up the same way). There are benches along the way if you want to rest. If you are tall, you will be bending down (or hunched) most of the time as you walk down and eventually when you reach the bottom of the Tunnel – the ceilings are even lower too. If you are claustrophobic, this is not a good place to visit. You will be given a hard hat to protect against hitting your head against the low beams in the Tunnel. There is a monorail in the Tunnel but when we were there, it was not working. No photography is allowed – you have to leave all your belongings at a locker (complimentary) outside the Tunnel. There are metal detectors at the entrance to the Tunnel. Overall, the Koridoor DMZ/JSA tour is quite a good one – no visits to amethyst/ginseng factories (some Koridoor tours do that so be sure to choose the right one). Children under 10 years old are not allowed to participate in this tour. If you have hyperactive children (10 years and above), this might not be the right tour to bring them along as there are a lot of places where you have to be at attention/on alert, and sit/stand in one place quietly. i want to sent a letter to solder kim hyun joong….but i don’t know the zip code…can you help me…?and the address is corect? hi, i just booked my JSA tour via Koridoor as well but abit confused with the booking procedure. How did you make payment after that? Will they send you a confirmation email for you to make payment? Btw, thanks for your informative post! 1. Cash(USD or Korean Won) payment in person. 2. Wire transfer (Korean Won) payment through a Korean / US bank. After you wire money to our account , please call or email us. Please be aware of the additional bank fees associated with wire transfers. KEB bank Address : 181, 2-ka, Eulji – ro, Chung – ku, Seoul Korea. When you pay by credit card it will be charged in Korean Won. If you have Visa card or Master card, you could pay by credit card over the phone. Or, if you can’t call, please send your card information to us by emailing. We need your card number and valid date. So when you deposit money to card company , the price will be possibly changed according exchange rate. it might be different our USD price. Thanks for the detailed write up! If I am not up for the tunnel, can I choose not to enter it? May I know if they required you to submit scanned color copies of your passports? If yes, when did you forward the copies to them? Or will they ask for it on the day of the actual tour? i think in their email to you, they will ask you to send them. Follow the instructions in their email closely. Sometimes their instructions change so i dont want to tell you the wrong thing – just follow their email instructions. Hi, thanks for your detail information. Did you booked this tour from Singapore? I am really interested in this tour but the payment by credit card via email or phone is so un-secure mode of payment, wondering how you make your booking and payment then? There is no secure way of booking it unfortunately so you will have to do so by email with them. That is what I did. Awesome write-up! I’ll be there tomorrow. Thanks! Your post is very helpful. I was undecided about the tour agencies until I read someone’s recommendation about Koridoor, and now I see your post. Hi, thanks for this! Very informative. I’m currently awaiting their email for payment. I can opt to pay in person the full amount on that day and my reservation is still confirmed right? Thanks for such a detailed write up especially the way to the USO office. I’m planning a trip to Seoul later this year but have not decided on the date to visit the DMZ. My Question: Can I make a booking for the trip by visiting the USO office personally once I reach Seoul (instead of making a booking via the web)? I’m aware that i have to do it 3 days in advance.